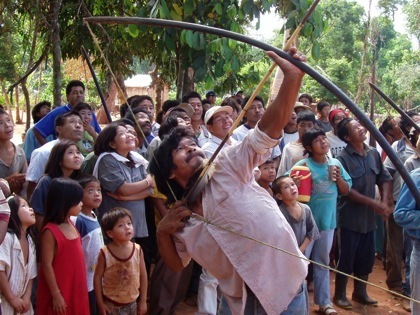 The Ach� (pronounced Ah�CHAY) Indians are a traditional hunter-gatherer tribe living in Eastern Paraguay. They are called �Guayak� by Guaran� speaking neighbors and in early anthropological accounts. The earliest published reports (Lozano 1873-74 summary of Jesuit accounts in the 1600s) about the Ach� refer to them as �Guajagui�, a term based on the Guaran� root �Guaja� (= enemy tribe, or brother-in-law) and �gui� a common Ach� suffix (meaning �essence of� or �having the property of�). The Ach� language provides clues to their origin. Current analysis suggests that it is comprised of a Tup�-Guaran� lexicon, overlaid on a partially unique grammar structure not found in sister Guaran� languages (Eva Maria Roessler, personal communication). Genetic analyses suggest that the Ach� are a group of mixed biological origin containing about 60-65% Tup�-Guaran� genes and 35-40% of their genes with affinities to the J� language family (Callegari-Jaques et al 2008). 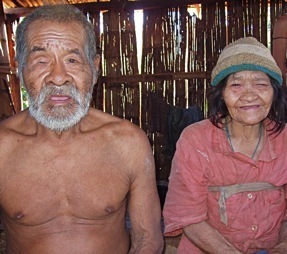 The Ach� are also culturally and biologically distinct from the neighboring Guarani. Early descriptions of the Ach� emphasized their white skin, light eye and hair color, beards, Asiatic features, and practice of cannibalism as identifying characteristics. Their subsistence practices and technology were considered extremely simple, and nomadism made them secretive and evasive. From the earliest Jesuit accounts of the Ach� in the 1600s until their peaceful outside contacts in the 20th century the Ach� were described as nomadic hunter-gatherers living in small bands and depending entirely on wild forest resources for subsistence (see Hill and Hurtado 1996: Chapter 2 for further descriptions). In the 20th century four different ethnolinguistic populations of Ach� were contacted and pacified. They are the Northern Ach�, the Yvytyruzu Ach�, the Ypety Ach�, and the �acunday Ach�. Each of these populations was an endogamous dialectal group, consisting of multiple residential bands and no peaceful interaction between them. The first archeological evidence of native peoples in Paraguay is represented by the �Altoparanense industry� of stone flaked tools found along the Parana river, and Celt-type stone axes similar to those still used by the Ache of the same region (and dated to about 9,000 bp.). About 500 AD. 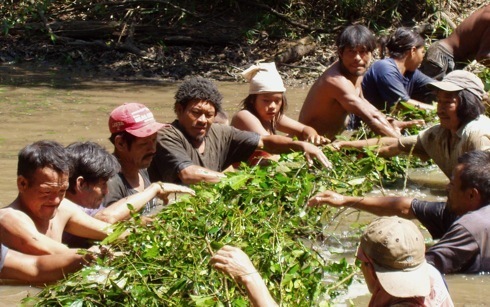 Guarani horticulturalists migrated in to the area and began to persecute the less powerful hunting peoples, perhaps causing them to move into forested hills away from open country and navigable rivers, and adopt a more nomadic lifestyle. Written history relevant to the Ache begins with the founding of Asuncion in 1524. A few years later, in 1554, a small village (Guaira) was founded by the Spanish on the Parana river near the site of modern day Guaira, Brazil. Fr. Luis de Bola�os arrived in Paraguay 1575, mastered the Guarani language and founded 18 Guarani villages in the province of Guaira between 1580-1593. Evidence of groups in Eastern Paraguay that might be Ache comes from the earliest Jesuit archives around 1620. 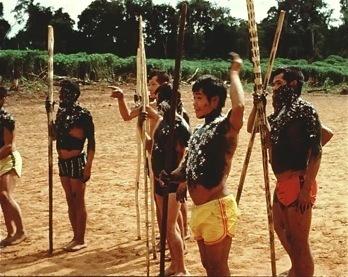 Non-Guarani groups that lived from hunting and gathering were often referred to as Caaygua or Caigua (Kaingang groups from the Southern Je linguistic family). Descriptions of some Caaigua match fairly well with 20th century descriptions of the Ache. 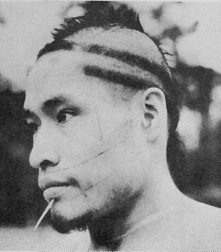 For example, Techo (1897) describes them as hunter-gatherers who ate only palm pith and fruits, venison and roots, and fastened little stones to their lips, which made them hideous, and he states that they worshipped only thunder. This is congruous with the Ache whose economy is indeed based on palm pith and meat, and whose spiritual beliefs place �Berendy� (associated with booming meteors) in a central position. Lozano (1873) provides a seven page early description of the Ache (called �Guayagui�) using a summary of Jesuit archives from the 17th century. This description includes accurate information about the Ache economy, social organization, culture and belief system. Lozano and Techo also described how some Ache bands were captured near the mouth of the Acaray river in the 1630s and forcibly brought to a Guarani Mission. That group of Ache captives all perished from disease within a few months. 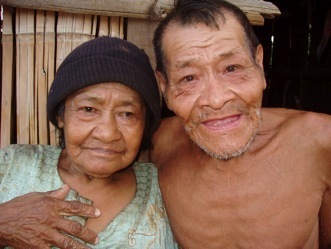 In 1959, after decades of persecution, the Ypety Ache were contacted in modern day Caazapa and pacified by Manuel de Jesus Pereira. Pereira then used Ypety Ache guides to track down, contact and pacify the Yvytyruzu Ache in the Guaira department in 1963. Both groups together numbered only about 100 individuals when contacted. Between 1963 and 1968 more than half of the Ache that had been recently pacified perished from disease while under Pereira�s supervision. During this time, the Ypety and Yvytyruzu Ache were studied and described by anthropologists Branislava Susnik, Leon Cadogan, and Pierre Clastres. 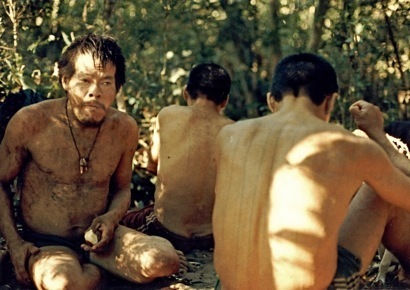 By the 1960s the Northern Ache were the last large uncontacted ethnic group in Paraguay, but they were constantly persecuted by colonists, loggers, and ranchers. Paraguay, like other Latin American countries, had a long colonial history of Indian enslavement that continued well after the official prohibition of slavery in 1869. Ache bands were systematically raided with the intention of killing the men, and capturing women and children. 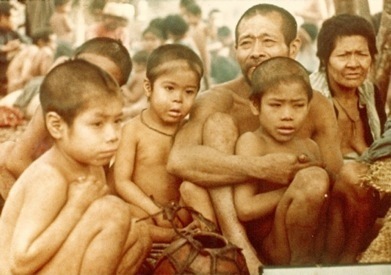 Ache children were sold openly in the region as late as the 1970s (personally observed). 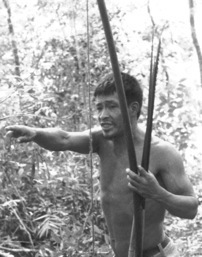 Although the pacification of the Northern Ache has been labeled as �genocide� by some writers (e.g., Munzel 1973, 1974, 1976), the situation was more complex, with autonomous peasant farmers and Guarani Indians encroaching on Ache lands, and attempting to drive them further into the forest, or pacify and capture them for use as cheap farm labor. 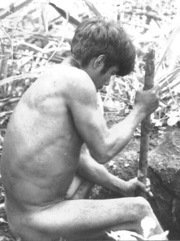 This pattern of indigenous exploitation and disenfranchisement was typical throughout Latin America. 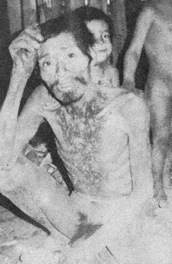 Much of the information presented in the context of the �genocide� charge was inaccurate or fabricated (see the link at the end of this section, and Hill 1983, chapter 2 for critique) and promoted mainly as a way to discredit the dictatorship of Alfredo Stroessner, and its alleged ties to Nazi refugees hiding in Paraguay. 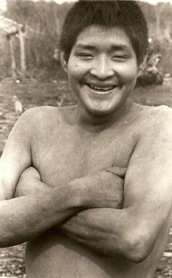 Because of increasing hostile encounters with Northern Ache during the construction of the new Saltos de Guaira road in the mid-1960s, Manuel Pereira moved with the Ypety and Yvytyruzu Ache to a site called �Cerro Moroti� in modern Caaguazu in order to track down and pacify the Northern Ache. At that time the Northern Ache still ranged free over a huge region from San Joaquin mountains to the Parana River and from the Acaray River north to the Mbaracayu mountains, and there were approximately 560 individuals in the population. 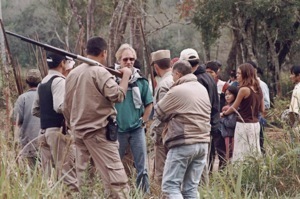 Pereira was encouraged to pacify this group and remove them from the area. 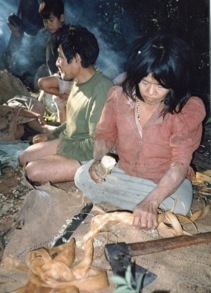 In October, 1970 several Ache from the Cerro Moroti reservation were attacked while hunting. They routed their attackers using newly acquired shotguns, and captured a Northern Ache woman who was taken back to Cerro Moroti. 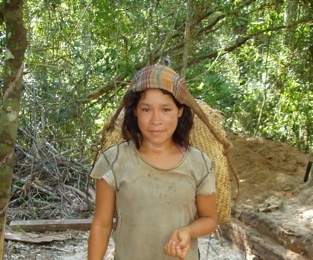 Within a month the captured Northern Ache woman led Pereira�s reservation Ache to her forest band, and the group was persuaded to move to the Cerro Moroti reservation in order to receive protection from �Papa Pereira�. This �surrender� was accomplished peacefully because many of the Yvytyruzu Ache living at Cerro Moroti had known and were related to members of this Northern Ache band (the two groups had only been separated in the late 1930s when the road to Cuidad del Este was constructed). 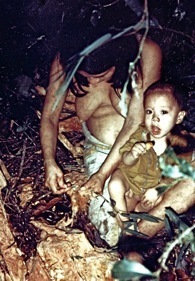 Between 1971 and 1978 at least ten different contact and extraction events of forest-dwelling Northern Ache took place. 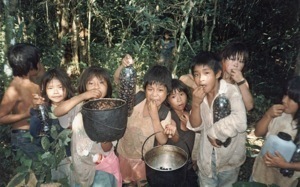 A high percentage of those taken to the Cerro Moroti government sponsored reservation (named officially the �Colonia Nacional Guayaki�) died from respiratory epidemics within two years after first peaceful contact. 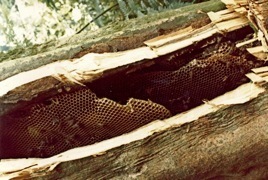 In addition several large bands fled from contact and suffered almost total mortality in the forest. Detailed demographic data on the Northern Ache population (based on extensive interviews with survivors) shows that 38% of the population died from contact related respiratory disease during this time period. This included 68 individuals who ran away from contact and died in the forest, 131 individuals who died at reservation/mission settlements between 1971-1978 and 49 individuals that were kidnapped by Paraguayans during the contact process and never seen again (Hill and Hurtado 1996). Although early reports locate Ache-like groups throughout Eastern Paraguay and adjacent areas of Brazil, by the 20th century the Ache lived in four dialectally distinct groups that inhabited the Parana River watershed in the modern day states of Caazapa, Guaira, Alto Parana, Caaguazu, and Canindeyu. The Northern Ache, who are best documented, ranged from the forests near Coronel Oviedo to the Parana River near Saltos de Guaira, a home range of approximately 20,000 square kilometers. 2000 mm per year on average and is characterized by high unpredictability in monthly pattern from year to year but with a statistical dry season from May to August. Seasonal temperature fluctuations are more consistent, with temperature extremes ranging between 39 and 0 degrees centigrade. 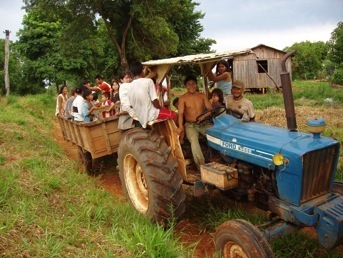 Eastern Paraguay contains regions of mature terra firme tropical forest (described in Hill & Padwe 2000), cerrado, grassland, palm-dominated swamps, bamboo forests, riparian flood forests, and a low drier forest type referred to as �kaati� by Guarani speakers. Although the region is an important endemic bird center with over 400 species of birds recorded in the past few years. (Madro�o & Esquivel 1995) mammals are far more important in the Ache economy. A provisional list of the mammalian fauna in the MFR includes 99 species of mammals identified by various methods (Hill & Padwe 2000). 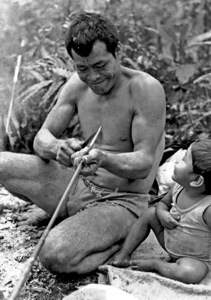 The Ache economy is traditionally centered on hunting vertebrate game with bow and arrow, extracting wild honey, and exploiting palm starch and insect larvae. Numerous fruits are also exploited seasonally, but they constitute only a small fraction of the energy in the yearly diet (Hill et al. 1984; Kaplan et al. 2000). 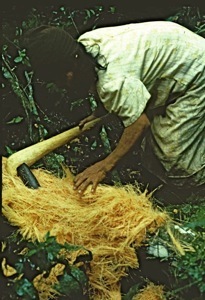 In the last half century before pacification Ache groups regularly raided their settled neighbors for manioc root (a starchy staple), domestic animals, and metal tools. Systematic recording of dietary intake while living in the forest entirely off wild foods suggests that about 80% of the energy in the diet comes from meat, 10% from palm starch and hearts, 10% from insect larva and honey, and 1% from fruits. Total energy intake is approximately 2700 kcal per person daily, and males acquire about 84% of all calories consumed. Children do not produce significant amounts of food until they are fully adult (all data from Kaplan et al 2000). Despite the presence of over 500 species of edible vertebrate prey, only 9 species of mammals provide more than 1% of the prey biomass actually harvested by Ache hunters. Most important (in descending order) are nine-banded armadillo, paca, tapir, capuchin monkey, white-lipped peccary, coatimundi, red-brocket deer, and tegu lizards (Hill et al 2003). 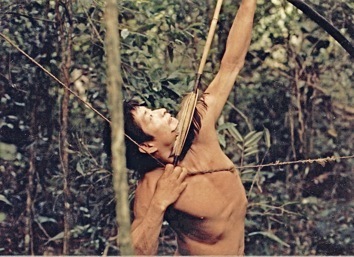 Ache men hunt with bow and arrow and by hand. They leave camp each morning as a group, walking in single file line, and then after about a half hour they begin to spread out and search for game. Men stay within earshot of other hunters throughout the day in order to call for assistance if cooperatively pursued prey are encountered. While searching, a hunter walks at a rate of about 1.5 km/hr and encounters the most common prey, armadillo, about once every 5 km on average. Monkeys and deer are encountered about 1/3 as frequently as armadillos, and other prey types are considerably more rare in the environment (Hill et al 2003). 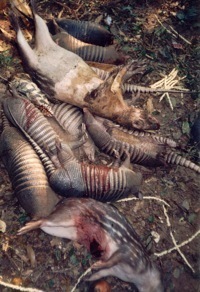 Armadillos, collared peccaries, deer, tegu lizards, tapir, and most other rare but solitary animals are stalked and pursued alone by bow hunters when encountered. Other species such as paca, monkeys, coatimundi, white-lipped peccaries, and social mammals are usually pursued by groups of men cooperatively, and encounters with these species usually induce men to call to others for help. Large and swift mammals are stalked and shot with bow and arrow. Smaller, and burrowing mammals are usually captured by hand and then slammed to death or suffocated. Because Ache hunting has been extensively studied using focal follow and other systematic methods, the encounter rates with prey, the time required for a successful pursuit, and the expected energy gains from prey types are all well known. This has allowed for numerous tests of specific decision models from Optimal Foraging Theory to be tested using Ache data (see Hawkes et al 1982, Hill and Hawkes 1983, etc etc). Results generally support the notion that Ache hunters pursue only prey items that would increase their energy return rates, and pass by some species (many small birds, rodents, reptiles, etc.) that would probably lower overall foraging returns if pursued. But, the question of why men hunt rather than spend all day extracting palm resources cannot be explained by energy maximization, since men obtain about 750 calories per hour hunting, and around 1,000 calories per hour extracting palm starch and hearts (see below). Hill (1985) has suggested that the macronutrient content of meat relative to plants means that meat is worth more nutritionally than equivalent caloric amounts of palm starch. Hawkes (ref) on the other hand has suggested that Ache men hunt because hunting is a form of costly signaling, rather than exclusively a manner to provision hungry family members. Collected resources include mainly palm hearts and starch, insect larva extracted from palm trees felled in order to encourage larva infestation, wild honey, and various fruits that ripen mainly between October and February. Two non-native species are now dispersed throughout the forests of Eastern Paraguay and contribute significantly to the diet. These are honeybees of European origin (Apis melifera), and volunteer oranges which were introduced by the Jesuits, and subsequently dispersed through the forest by birds and monkeys. Despite the plant diversity, and dietary variety introduced by the various collected species only palm hearts and starch, and bee honey contribute significant energy to the Ache diet. Palm starch is the most important carbohydrate staple in the Ache diet. Palm trees are cut, then a small �window� is cut in the trunk to test out the inner pith, which when edible is soft and juicy with a high concentration of starch. The growing shoot (heart) is extracted from each cut palm, but this resource has a high water content and provides only a small caloric contribution to the diet. 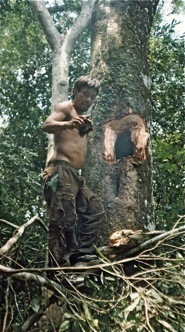 When a trunk with good starch is discovered, one or more women will open up most of the trunk from base to top of the tree and systematically pound the fiber with the back of an axe to loosen it up and soften it. Large amounts (15-50 kg) are then transported back to the camp in baskets for further processing. At camp the palm fiber is dipped handful by handful into a pot full of water and wrung out by hand to extract all the starch. 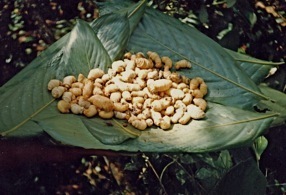 The pot of water containing the starch is then used to boil meat or insect larva. This mixture will be eaten hot (as a thick gravy broth) or allowed to cool overnight, which hardens it into a pudding. Although random transects show a high density of palms in the Mbaracayu region of Paraguay, most of these do not contain starch. Recent work shows that it takes about 15 minutes to find a candidate palm to cut down and then only one out of 8 trees cut has any starch. Thus, by spending a few hours searching for, and exploiting palms, Ache foragers can acquire carbohydrate energy at a rate of just over 1,000 calories per hour. During food acquisition Ache foragers are frequently observed to engage in activities that require some time or effort and appeared mainly designed to raise the foraging return rate of another adult or unrelated child. We call this cooperative foraging. (see Hill 2002). The data suggest that foraging cooperation is widespread and intense, accounting for a good fraction of total foraging time, and including a high number of potentially costly acts that are performed on a daily basis. Cooperation also includes some actions that are not very costly to the donor but highly beneficial to the recipient. Most importantly, the cooperative patterns observed during food acquisition are almost certainly related to the well studied Ache food sharing patterns (Kaplan and Hill 1985; Gurven et al 2000 a; Gurven et al 2001; Gurven and Hill 2001). 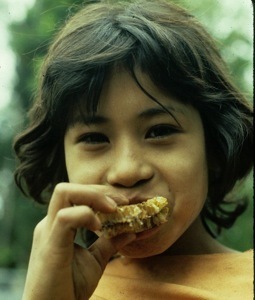 Reciprocation of foraging cooperation takes place in the form of food redistribution. Finally, cooperation during food acquisition represents only a fraction of total cooperative activity in Ache society. Indeed, cooperative food acquisition, food sharing, and cooperation in other realms such as child rearing, mobility, camp construction, defense, etc., are all part of an integrated system of reciprocal altruism and cooperative promotion of group welfare among the Ache. Cooperative activities during foraging time included the following: cuts trail for others to follow; makes bridge for others to cross river; carries another�s child; climbs a tree to flush a monkey for another hunter; allows another to shoot at prey when ego has first (best) shot; allows another to dig armadillo or extract honey or larva when ego encountered it; yells whereabouts of prey escaping; calls the location of a resource for another individual to exploit while ego continues searching; calls another to come to a pursuit of peccary, paca, monkey, or coati; waits for others to join a pursuit thus lowering own return rate; tracks peccaries with no arrows (for other men with arrows to kill); carries game shot by another hunter; climbs fruit trees to knock down fruit for to collect; cuts down palms (for others to take heart or fiber); opens window to test for kraku (for others to come take); carries the palm fiber others have taken; cuts down fruit trees for others to collect; brings a bow, arrow, ax or other tool to another in a pursuit; spends time instructing another on how to take a resource; lends bow or ax when it could be used; helps to look for another�s arrows; prepares or repairs another man�s bow and arrows in the middle of a pursuit; goes back on trail to warn others of wasp nest; walks toward other hunters to warn of fresh jaguar tracks, poisonous snakes; removing dangerous obstacles from the trail before others arrive. The estimate of cooperative time presented below is a minimum estimate since data were not originally collected with a focus on recording all cooperative activity. Short cooperative activities were especially unlikely to be recorded in field notes. For example, examination of video tapes from hunting episodes during the sample period reveals that very short cooperative activities are frequently embedded into longer hunting segments that we have not coded as cooperative time. While pursuing monkeys, hunters often call to others to �stay put�, �don�t make noise�, �don�t shoot�, �shake a branch�, �pound a vine� etc. Other multi-hunter pursuits contain numerous similar requests. The recipient of such a command almost always complies momentarily at a cost to his own chances of making the kill. These events were extremely common but of very short duration (usually only 10 seconds or so) and are not included in the analyses. Ache men spent an average of 41(s.e. 7) minutes per day in food acquisition activities scored as cooperative, and women spent 33 (s.e. 14) minutes per day cooperating in foraging (Hill 2002). This represents about 10% of total foraging time in the men�s sample and 11% of total foraging time in the women�s sample. Both sexes show some sample days with more than 50% of total foraging time being spent helping other individuals to acquire resources. share their game and collected foods to those who prepared the fishing spot. 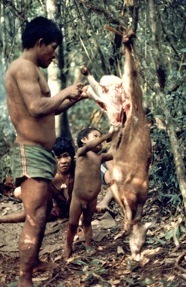 Ache foragers living in the forest share food extensively, and animal prey are divided up communally among band members. Social norms proscribe men from eating anything from their own prey and emphasize the importance of band-wide distributions. In essence, wild game is cooked and redistributed in equal portions to resident families, taking into account the size of each family that receives a portion. This means that successful hunter�s and their families obtain no more meat from their own captured prey than would be expected by a random distribution to resident families (Kaplan et al 1984). 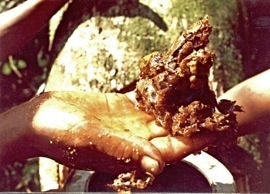 Palm starch produced in large batches is shared in a manner similar to meat (but with no overt taboo against women consuming some of the starch they have extracted). Honey is somewhat less widely shared, but large portions are saved for members absent at the time of extraction. Collected fruits and insect larva are insect larva are even less widely shared but are still redistributed to those not present at a collection site. A hunter�s nuclear family usually consumes about 10% of the game brought in by the male head of the household. For most other resources the nuclear family of the acquirer keeps less than 50% for their own consumption, but only 10-20% of small collected fruits are shared outside the family (Kaplan and Hill 1985). More recent analyses show that high acquisition variance resources are shared more widely, that amount of most foods shared is contingent on amount received across dyads of potential sharing partners, and that needy families consistently receive more than they give (Gurven 2004a,b; Guven 2006). Reservation food sharing patterns show that people who are more generous are more likely to receive help and support when they become sick or injured (Gurven et al 2000). One man divides the monkey while another decides who gets what piece. 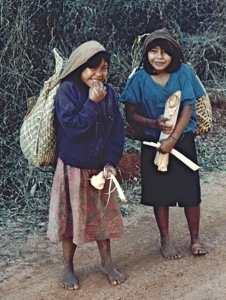 Ache foragers in the pre-contact period lived in small bands ranging from 3-4 families to a couple dozen families (median band size is ~50 individuals, Hill and Hurtado 1989). But these residential units often subdivided for a few days and occasionally coalesced into large gatherings, thus the composition of reported bands in systematic interviews ranges from 3 to 160 individuals. During club-fighting rituals three or four bands might unite, resulting in temporary camps of 200 or more individuals that might camp together for 5-15 days before dispersal. More frequently bands of many families would break up into temporary task groups that would leave children and older band members in a permanent camp while younger adults traveled to distant areas for a few days in search of specific resources that were depleted nearby. On such forays, successful task groups would return to the main camp laden with smoked meat and other goodies. Band membership was highly flexible over time and based as much on affinal ties and friendships as on consaguineal relations. Some small groups of kin (a couple brothers, or brother-sister groups) usually formed the core membership of each band, but composition appears to be highly flexible when assessed over a period of years. Bands did not have territories but did have favored home ranges from which they strayed only occasionally. Bands were not named, but often referred to by the name of the most influential male member (ie. Tayjangi-the-killer�s band). Ache societies were not organized into any specific kin or ritual groups, and leadership was informal and often context specific. There were no recognized chiefs, nor any other political-religious office. 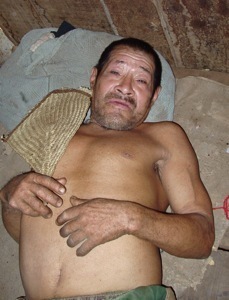 The Ache had no specialist shamans but older individuals and pregnant women were often involved in healing activities. Decisions were reached through informal consensus, and strong dissent was expressed by abandoning a residential band. Women were involved in most discussions, but some mean were clearly politically dominant, and men who had killed (called �jaychagi�) were especially feared and �respected�. These killers often sharpened their bowstave at one end to look like a spear point, and threatened others by their demeanor. Children were especially terrified of the killers who made a grand display of noise (growling), bluff and bluster (shaking tree branches and swaggering) when entering a residential camp after a day of hunting. Marriages were not arranged, but determined mainly through female choice and first marriages for most females took place at or before menarche (about age 14-15). Divorce rates were high, but polygyny was uncommon (~4% of marriages). Polyandry was occasionally reported (< 0.5% of marriages). Most post-reproductive women had been married to at least 10 different men and had born children with at least two men. There were no patterns of prescribed marriage, but siblings, first cousins, and some individuals in ritual relationships were prohibited from marrying each other. Ache camps are socially enjoyable. Everybody mixes work and play, with joking, talking, tool making, babysitting, sleeping and playing all taking place simultaneously. Children learn by watching and trying, rather than by formal teaching. Forest camps are filled with noise and can be heard for a long distance when there are no enemies nearby. Ache cultural conventions emphasize food sharing, regulated cooperation, group participation in raising and nourishing children, restrained violence, and marriage proscriptions for members of the ethnic group. Behaviors towards outgroup individuals is unregulated. The birth of a child introduces a series of lifelong obligations between the child, its parents, and those who take on ritual roles during the birth. The child�s mother is helped during labor and later is ritually washed by some of the helpers. The child will be held immediately after birth by a �godmother� that is responsible for washing and caring for the infant during the first few days after birth while mother rests. The child and godmother adopt ritual terms for each other, and the child can expect food, help and support from its godmother throughout its life. A man cuts the umbilical cord of the child and becomes the �godfather� with similar lifelong obligations. 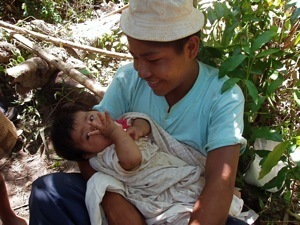 Men who have provided the mother with game during her pregnancy also take on a ritual obligation to the child, and so do all the band members who hold the child and wash it soon after birth. The obligations through the life course are reciprocal such that the child is cared for by ritual �godparents� when young and later cares for them in turn when they become elderly. Both biological parents and all the ritual godparents retain lifetime obligations of mutual aid. 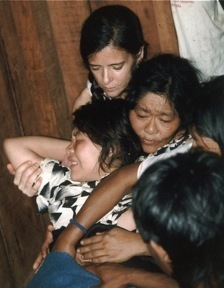 When a girl reaches menarche she is held in the lap by adults in a ritual similar to that at birth. 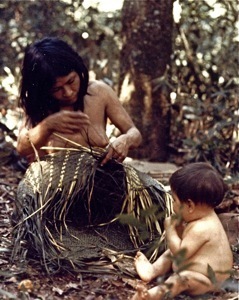 She is then partially secluded for some time, being covered with woven palm-leaf mats. 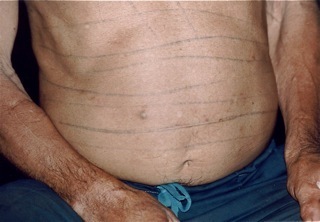 After seclusion she is cut with broken glass and charcoal is rubbed into the wound to create a set of linear parallel tattoo marks. Men who have had sexual relations with her prior to menarche also undergo ritual purification at this time. 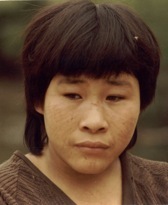 Women keep their hair cut short and wear seed and tooth necklaces as tribal ethnic identifiers. 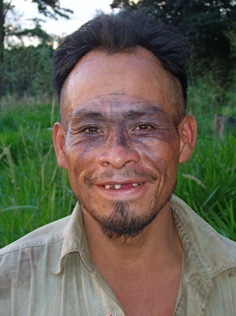 When boys begin to show facial hair growth they too undergo a puberty ritual which is usually timed to coincide with a birth or female puberty ceremony. 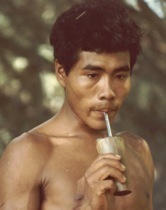 Their lower lip is perforated with a sharpened bone, and then a wooden labret is introduced. This adornment is worn only by younger men, but all men retain the perforation in their lip for life. 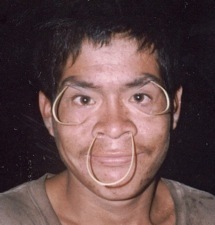 After the lip-piercing ceremony, young men are cut and tattooed in the same fashion described for young women. 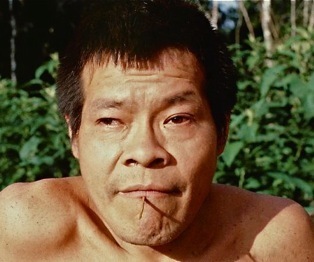 The man who perforates their lip becomes a ritual godfather. Newly initiated young men usually accompany the ritual godfather for some time, often leaving their own nuclear families behind. The most importan t northern Ache ritual was the club-fight. These events were organized by �big men� and took place once every year or two. Several bands would converge on a single camping area. Those who invited the others would prepare a cleared area in which to do ritual combat. 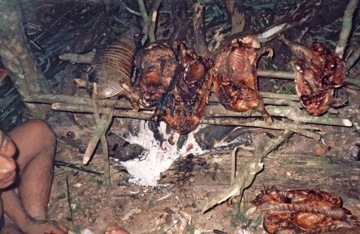 Men prepared long hardwood clubs with sharpened edges (paddle-shaped), and decorated themselves with charcoal (mixed with honey and saliva) and vulture down. Although club fights consisted of hosting and invited teams of men, after the fighting began all men were free to choose opponents from either group. Men faced off and took turns swinging at each other�s heads. Some men were hit directly on the top of the head and sustained fractured skulls that later healed but with tell-tale signs of combat. Other men dodged the clubs but might be hit the arms or shoulders. Some men died in almost every large clubfighting event. Sometimes clubfighting would also emerge spontaneously within a small residential band when one band was caught having sexual relations with another man�s wife. These types of duels were never lethal. In all clubfights some bystanders (including women) would rush in and try to hamper or disarm men who were in combat with their father, sons or brothers. Men who killed others would be decorated with ritual scars on their body and face. Ache mythology is centered around �berendy� a flaming thunderous being that at times takes the form of a meteor and at times has a body of flesh and blood. Berendy�s son is the subject of several myths, which also include themes of the origin of jaguars, the sun and the moon (as twins with the sun being the child and the moon the placenta), the origins of fire and darkness, and some moral tales about stingy old men and old women. Northern Ache emphasized the spiritual powers of a being that manifest itself as both shadow and wind. Southern Ache groups included a malevolent spirit that originates from the souls of angry deceased Ache. 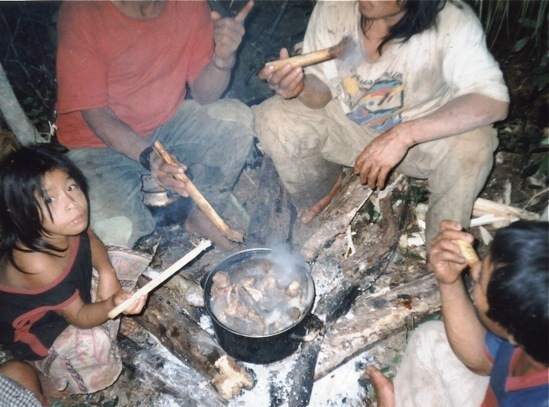 One of the four groups of Ache practiced cannibalism regularly until the 1960s (see Clastres 19xx), and the northern group sometimes cremated old people thought to harbor dangerous vengeful spirits. All Ache believe in some types of hunting magic, and in the curative powers of pregnant women. 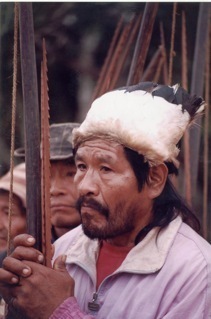 Ache men believe that some hunters acquired powers that allowed them to kill game without arrows simply by �throwing� a killing power at the prey. Older Ache are still the guardians of traditional myths, magical and spiritual beliefs. Ache demography has been extensively studied and analyzed in the framework of evolutionary life history theory (Hill & Hurtado 1996). 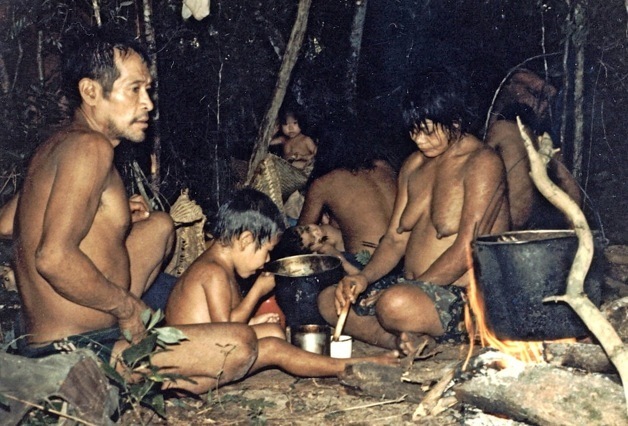 Major causes of death in the forest period were in-group homicides (especially of infants and children), external warfare, respiratory disease, tropical fevers, and accidents. Over 40% of all adult deaths and more than 60% of all child deaths were due to violence by other Ache or outsiders. In the forest period about 65% of all children born survived to adulthood (age 15), and life expectancy for those young adults was an additional 40 years on average. Old age is common for those who survive to adulthood. Fertility was high with completed family sizes of post reproductive women just over 8 live births. Analyses indicate that high return hunters, and large bodied women had higher lifetime reproductive success than their peers. More detailed information relevant to theories about body size variation, age at menarche, menopause, life history tradeoffs, etc. are presented in Hill and Hurtado�s 1996 book �Ache Life History�. 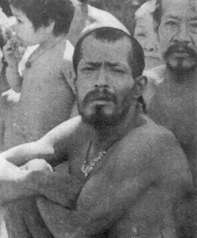 The post-contact history of the Northern Ache begins with chaos at Cerro Moroti following the arrest of Manuel Pereira and the newly appointed administration of New Tribes Missionaries in September 1972. Small groups left the reservation almost every day and dispersed along the new road from Santa Rosa Cue to the Carapa river. Many joined Pereira for a short time at Ybyrycua and then left again. 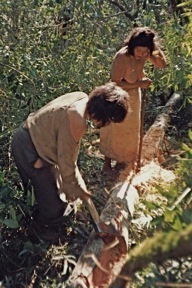 Some reentered the forest and many were persuaded or coerced to stay on as laborers in small Paraguayan settlements and isolated rural houses. The situation changed dramatically in 1974-75 when Father Nicolas de Cunha, began to systematically collect these refugees onto the Catholic Mission San Agustin. This settlement began on the Carapa River but then moved to borrowed land on Arroyo Manduvi near Laurel, Alto Parana. 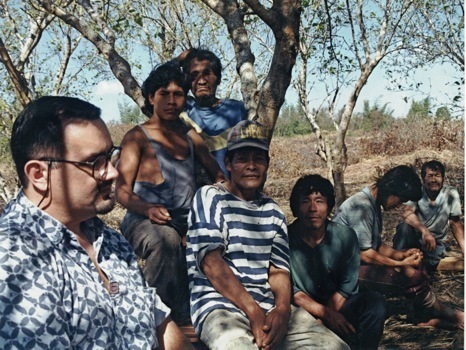 The Manduvi group was under the direction of Padre Alejandro Pytel, and in 1978 after Padre de Cunha died suddenly, Pytel convinced the Verbo Divino order to purchase new land for a permanent mission. The entire Manduvi group moved to a new mission, located at Chupa Pou in August 1978. 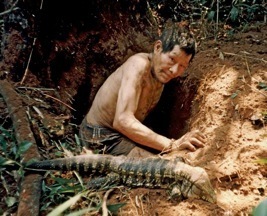 For the next 20 years the Chupa Pou mission grew into the largest Ache settlement in Paraguay, while the Colonia Nacional in Cerro Moroti decreased in size, lost most of its original land holdings, and, increasingly intermixed and intermarried with the neighboring Paraguayans. 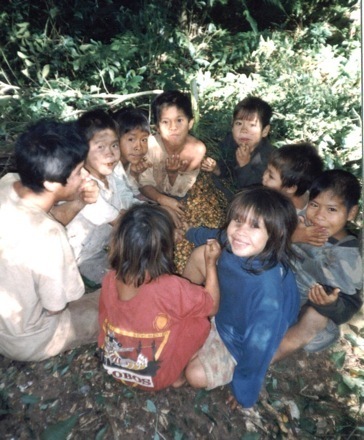 Following the original dispersal from Cerro Moroti, several more Ache communities were formed over the next 25 years. 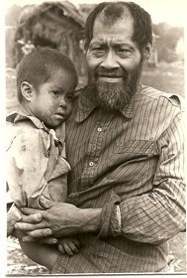 First, in 1976 the missionary family of Rolf Fostervald, contacted and protected the Ynaro/Nacunday Ache that were on the verge of extermination. This settlement, called Puerto Barra, was located at the confluence of the Ynaro and Nacunday rivers at an old sawmill. Then soon afterwards a group of Southern Ache and their affines and associates left Cerro Moroti to found a new colony near the traditional home range of the Ypety Ache. This settlement, located in the state of Caazapa, is referred to as Ypetymi (also Tupa Renda). Next, in the early 1980s a dozen families from the Chupa Pou reservation left to join the Ache band that had been contacted in the Mbaracayu reserve in April 1978 and was living at a German Mission for Guarani Indians. The Ache separated from the Guarani and formed the community now called Arroyo Bandera at the edge of the Mbaracayu Forest Reserve. Finally, twenty years after its formation, the Chupa Pou community fissioned, resulting in the colony now called �Kue Tuvy� (see below). Currently there are six legally recognized Ache communities: Cerro Moroti; Ypetimi, Puerto Barra; Chupa Pou; Kuetuvy; and Arroyo Bandera. The Chupa Pou reservation is the largest of these and also the main center of the Northern Ache sub-group. 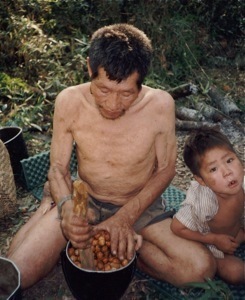 The Chupa Pou Ache consist of approximately 80 families residing south of Villa Ygatimi along the Jejui Guasu river. Arroyo Bandera is located directly west of the main entry to the Mbaracayu Reserve (15 km north of Ygatimi), and contained 148 inhabitants (about 30 families) in January 2006. The most recent Northern Ache community is that of Kuetuvy, which contained 205 residents (about 55 families) in January 2006, and is located directly south of the Mbaracayu Reserve on the property designated as �Finca 470�. 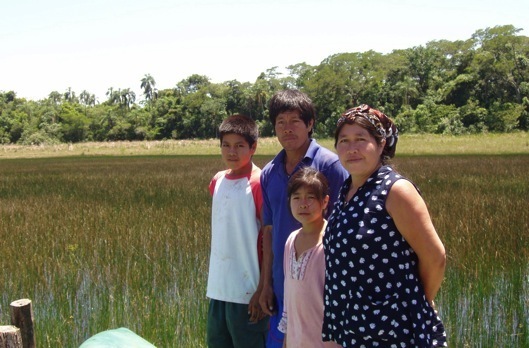 Initially, the Fundacion Moises Bertoni (FMB) intended to purchase Finca #470 from its Taiwanese owner with funds raised in the US, Taiwan, and other foreign countries and then transfer the title of the property to the Kuetuvy Ach� as an �Indigenous Forest Reserve�. In June 2000, Alberto Yanosky, then acting director of the FMB, made a verbal agreement with Kuetuvy leaders as to the conditions under which the FMB would purchase and transfer the property to the Ach�. The agreement between Kuetuvy and the FMB included the development of a sustainable management plan and a promise not to cut more than 5% of the forest on the property for residential areas and agriculture. The Ach� proposed these conditions and pledged to sign a binding agreement to that effect. The FMB carried out an evaluation of the property and made a purchase offer in late 2000. The Taiwanese property owner accepted the FMB offer to purchase the property on January 15, 2001. 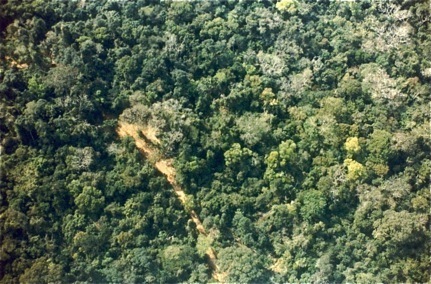 But, in the months following the initial agreement between the FMB and the Kuetuvy Ach�, the Paraguayan Ministry of Public Works (Ministerio de Obras P�blicas) and the Secretary of the Environment (Secretar�a del Ambiente) began negotiating independently with the property owner to purchase Finca #470 as part of a conservation land quota required by the Interamerican Development Bank (Banco Interamericano de Desarrollo � BID) in order to meet conditions for a BID loan for the route 10 project in Canindeyu. During that negotiation the owner of Finca #470 notified the FMB that he was no longer interested in selling the property to any NGO. 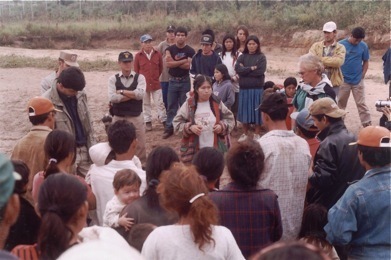 When the Kuetuvy leaders discovered that the Paraguayan government intended to purchase the property as part of a conservation easement plan, they immediately presented a formal �request� for expropriation to the Paraguayan National Indian Institute (INDI) and the Secretary of Environment (SEAM). In January of 2001 clandestine loggers working for Brazilian sawmills began a massive invasion of Finca #470 aided by �landless peasants� who promised to protect them if they cleared roads and allowed for subsequent settlement on the property. 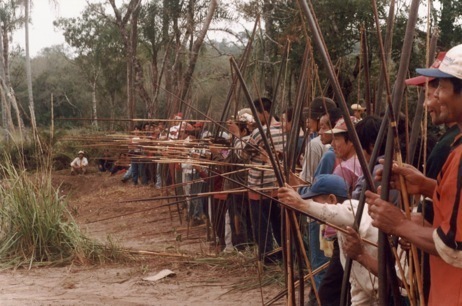 The loggers were evicted in December 2001 and the landless peasants were permanently removed in July of 2002 after armed Ach� warriors patrolled the southern boundary of the territory. 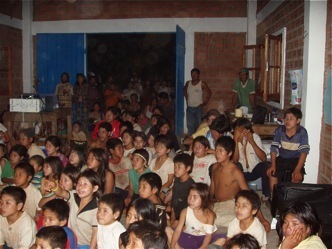 Between July 2001 and late 2003 Ach� leaders attended dozens of meetings with representatives of Paraguayan government agencies (INDI, SEAM, Oficina de la Procuradora de la Nacion) and NGO�s (Fundacion Moises Bertoni, World Wildlife Fund, Avina, PROSAM) interested in supporting their claim to Finca #470. All representatives of both government agencies and NGOs assured the Ach� that the land would be titled to them once expropriated by the Paraguayan government. In early January 2002 the Ach� received a letter of permission to occupy Finca #470 from the Secretary of the Environment, and the Kuetuvy Ach� permanently settled the property on January 8, 2002. 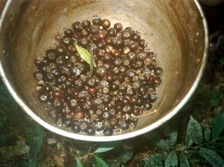 In June 2002, the Ache began systematic conservation work on the Finca #470. An Ach� resource management team trained by Kim Hill performed partial forest inventory and animal density counts on Finca #470 using random transect methodology. During that month the Ach� management team also did two aerial overflights of the property with GPS receivers and detailed maps. During June-July 2002 there was a second attempted invasion of the property by so-called �landless peasants�. Ach� leaders called the national press, several government officials, and organized a show of armed resistance which was attended by representatives of all six Ach� reservations. 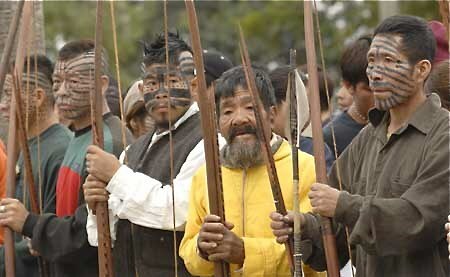 Over 200 armed (with bow and arrow) warriors stood along the border of the property near the campsite of the would-be peasant invaders. 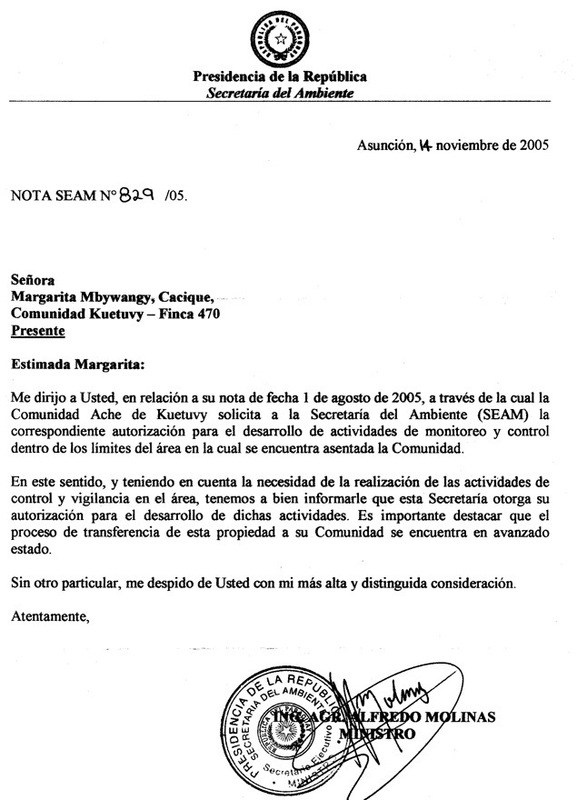 On July 24 2003 the political leaders of Kuetuvy gathered their community and all adult members signed a document requesting INDI to obtain legal title to the Finca 470 property from SEAM and transfer the title to the Ach� community. 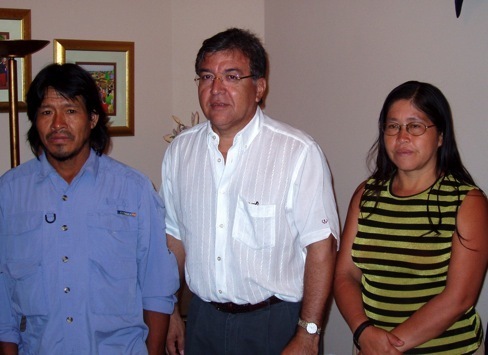 On Feb 10, 2004 religious and political leaders from Kuetuvy met directly with President Nicanor Duarte Frutos at �Mburuvicha Roga� and were assured by the Paraguayan President that they would receive title to Finca #470. The Ache indicated that they would manage the property as an �Indigenous Reserve� and requested technical assistance in order to develop a sustainable management plan. 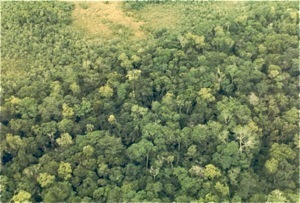 They proposed to conserve a large area of forest where activities would include sustainable hunting, collection of edible fruits and insects, collection of medicinal plants, enrichment of the forest with commercially valuable native tree species such as Yerba Mate, and minimal impact forestry based on long cycle rotation and low-impact harvest and transport. The forestry-based products would be primarily destined for internal consumption in the form of houses, school buildings, clinics, etc.. The Secretary of Environment (SEAM) responded with support for the Ache proposal and signed an Agreement of Inter-institutional Cooperation for five years with the Paraguayan Indian Institute (INDI) and the Ache leaders on September 2, 2004. The first clause of the agreement states that �� the purpose of this agreement is to cede temporary use rights of the SEAM property called Finca 470, in the District of Ygatimi, Department of Canindey�, to INDI with the ultimate intention that the Ache Indigenous Community of Kuetuvy can continue their customary subsistence activities, in agreement with principles of nature conservation. This is done, taking into account that the Finca 470, object of this agreement, is a forestry reserve of biological and botanical resources, considered part of the �lungs� of the Atlantic Interior Forest, and located inside the buffer zone of the Mbaracayu Forest Reserve. In this way we hope to establish mechanisms to guarantee the joint process of transferring land rights of the Finca 470 to the native peoples located in that place, and in observance with the National Constitution and laws 352/94, 904/94, and 234/93�. At this time the Ache were again provided official authorization to protect and patrol the property in order to ensure that no illegal logging or poaching activities took place within the boundaries, or in the nearby Mbaracayu Reserve. In March 2005 the Ache presented a management plan for Finca 470 to SEAM and on May 3, 2005 the Secretary of the Environment responded to the leader of the Ache community, Margarita Mbywangi in note 291/05. That document from SEAM expressed agreement with the terms of the Ache management plan of March 29, 2005 (stamped as received by the SEAM document #33084). SEAM agreed to: first, accept the regional management plan presented by the Ache community; and second, initiate the process of transfer of title from the SEAM to the Ache Community Kuetuvy, which had been solicited by request to SEAM on April 28, 2005 in note #34128. In this fashion, SEAM indicated that the necessary steps were being planned taking into account that the process must comply with certain regulations in order to legally cede title to the community. The request for executive action on the Kue Tuvy land title was submitted again to the President on March 6, 2006 (SEAM note 177/06) by the Secretary of the Environment, Alfredo Molinas. 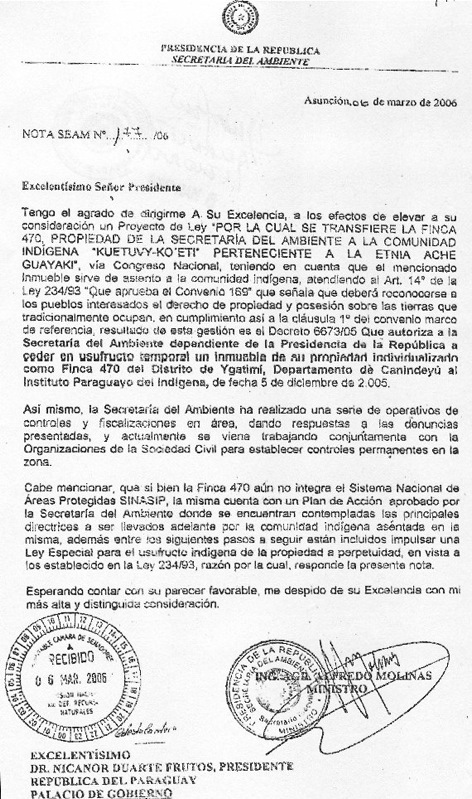 In summary, the Secretary of the Environment twice directly solicited the office of the President to carry out the administrative processes necessary in order that the Escriban�a Mayor de Gobierno, the Paraguayan Indian Institute, and the Indigenous Ache Community all work together to guarantee success in the process of transferring the title of Finca 470 to the Ache Community of Kuetuvy. Despite this request in August of 2005, and again in March 2006, no significant steps have been taken to further the land titling process since that time. Instead the Ache have fought and endless battles against illegal loggers, speculators, and so-called �landless peasants�. Margarita Mbywangi, the chief of the Kuetuvy community was arrested and imprisoned in Curuguaty in December 2005 along with members of the forestry patrol team who had tried to stop illegal loggers from extracting valuable hardwood trees from the property. The Ache suffered repeated abuses by rural Paraguayan colonists, ranchers, and big landowners from the conquest period to the 20th century. In recent times they have been massacred, enslaved, and gathered on to reservations where no adequate medical treatment was provided. This process was specifically carried out to pacify them and remove them from their ancestral homeland so that absentee investors (mainly Brazilian) could move in and develop the lands that once belonged only to the Ache. The same moral justification that was used during the 16th century to murder, enslave, and exterminate the indigenous peoples of America continued in Paraguay through the 20th century. Large multinational business groups (eg. Industria Paraguaya) obtained title rights to already occupied lands and then sold them sight unseen to investors who purchased lands where Ache bands had roamed for thousands of years, and were still present. The fact that Ache inhabitants were present and living in the forests of Canindeyu and Alto Parana on the very lands being titled in Hernandarias, Coronel Oveido, and other government centers seems to have bothered nobody. In the 20th century the Northern Ache began as the only inhabitants of nearly 20,000 square kilometers, and ended up confined on two reservations totaling little more than 50 square kilometers of titled land. The fact that the Paraguayan government has never recognized the large-scale theft of Ache lands and forced displacement of Ache people is reprehensible. That the Paraguayan government has never rectified this situation or offered any compensation for these crimes is morally pathetic. Other than the tiny thousand hectare plot ceded at the Colonia Nacional Guayaki in Cerro Moroti, the Paraguayan government has left the Ache homeless, to fend for themselves as beggars and unpaid servants. The Chupa Pou reservation was purchased by the Catholic Church. The Arroyo Bandera reservation was purchased by the German Mission and Fundacion Moises Bertoni. Now the government has a chance to comply with ILO Convention 169 and the United Nations Draft Declaration of Indigenous People's Rights from 1994. 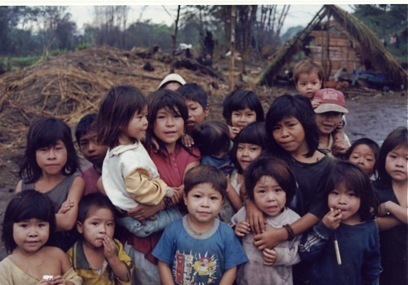 That declaration recognizes �the urgent need to respect and promote the inherent rights and characteristics of indigenous peoples, especially their rights to their lands, territories and resources, which derive from their political, economic and social structures and from their cultures, spiritual traditions, histories and philosophies.� Paraguay has failed to comply with international law. The Kuetuvy Ache were forcibly removed from the Mbaracayu region in the 1970s but managed to return to their ancestral homeland in 2000. Since that time they have begged, urged and demanded that the government provide them with a piece of their ancestral homeland, but all to no avail. On Feb 10, 2004 religious and political leaders from Kuetuvy met directly with President Nicanor Duarte Frutos at �Mburuvicha Roga� and were assured by the Paraguayan President that they would receive title to Finca #470. Still nothing has happened. Instead the Ache have heard one excuse after another concerning why the land cannot be titled to them at this moment. 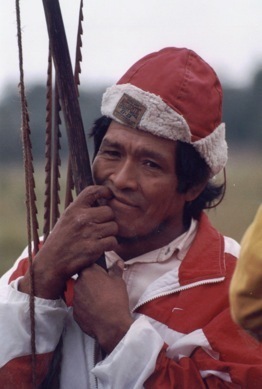 They have been asked again and again to be patient in waiting for their human rights to be respected, in waiting for the Paraguayan government to comply with international law, in waiting for the Paraguayan government to rectify the pilfering of their lands and the near extermination of their people. In April 2008 the corrupt and inept government of Nicanor Duarte Frutos came to an end, as the Colorado Party finally lost political control over the country after more than 60 years of one-party rule. 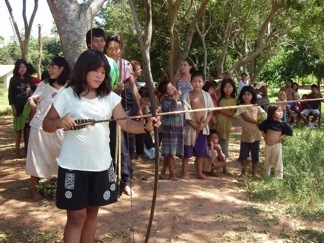 The Kuetuvy Ache continue hoping to recover a small portion of their ancestral territory, where they can live productive lives as members of Paraguayan society and also protect the valuable natural resources of the area while harvesting plants and animals according to their traditional culture and in a sustainable manner. These activities will be carried out according to the forest management plan developed by the community with technical assistance of various groups and individuals who share the Ache values. How long will they have to wait for justice, and the legal title to the lands of their ancestors? With the end of Colorado Party rule, and the ascension of Fernando Lugo as the newly elected President of Paraguay, important changes have taken place in the Ache community. Margarita Mbywangi was appointed as the President of the National Indian Institute (INDI), which is the main governmental unit that administers all aspects of indigenous affairs at a national level (equivalent to the BIA in the U.S. or the FUNAI in Brazil). To our knowledge Margarita is the first indigenous leader to be appointed as the head of any high level administrative unit that oversees native affairs anywhere in the Western Hemisphere. This represents an incredible personal accomplishment by Margarita who was captured in the forest and sold into slavery as a child, later to escape and become chief of her community and then president of the Ache pan-tribal organization, Asociacion de Comunidades Ache. More importantly it is an important precedent that challenges other nations of the Americas to empower capable native leaders with high-level decision and policy appointments in national governments.